The Heartfelt Creations booth is like the biggest and most beautiful flower shop in the world! 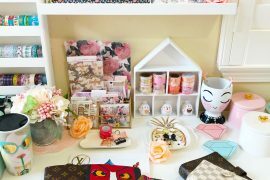 Well-known in the paper craft industry for their gorgeous detailed rubber stamps and matching die sets, the projects on display showcased everything from cards to 3D paper crafts to scrapbook layouts and more! The newest collection “Flowering Dogwood” is so beautiful! It can be used for Easter themed projects and more. Another recent release is “Wildwood Cottage” with adorable fairy themed patterns and images in woods and gardens. It was exciting to see one of our team member’s gorgeous projects on display. Tracy McLennon’s scrapbook layouts are just stunning! To learn more about Heartfelt Creations and be inspired, click HERE to visit their blog and website. SUBSCRIBE TODAY to our quarterly publication – delivered right to your door!